I had an appointment with my midwife group this week. We were scheduled to do an ultrasound, but I cancelled it because we decided not to do any of the genetic testing. The non-invasive tests have a high-ish rate of false positives, which then lead to having to make the decision of doing the invasive (risky) tests. I understand why people do it! We just decided not to. We did end up seeing the little one though because the midwife couldn’t find the baby’s heartbeat with the doppler thingy—she used a mini-ultrasound gadget, so we got an unexpected glimpse! She (I still swear it’s a girl!) was doing kung fu and punching/kicking all over the place. I think she takes after her Dad—he loves to dance and has a hard time sitting still. She’s the size of a lime, and my uterus is the size of a grapefruit. My gut however, is exponentially bigger than that—and I wholeheartedly support my eating habits/weight as a necessary coping mechanism against being sick. Honestly, I feel WAY better this week! I stopped eating so much toast (none since Saturday! ), and have eaten more fat and protein than carbs. I ate some fruit yesterday and felt really awful all night—so I’m thinking I was definitely causing some of my issues by eating more sugar than my body is used to. I feel like I have a lot more control now. Food I ate this week: cottage cheese (by the gallon! ), avocado pudding (but I didn’t really enjoy it), salmon, steak, sandwiches with roasted turkey (usually with one piece of bread, but I had an amazing one on a pretzel roll that was too good not to eat! ), homemade chicken broth, scrambled eggs with gouda (for the vitamin K2! ), and… not many veggies. I’m working on that! I realize these bump pics are getting redundant—no real bump. Honestly, I have spent hours on Pinterest looking at 12-week bump pics to compare mine to other people’s, and other than the really skinny people, most everyone has a bit of a bump at this stage. I’m thinking it’s not baby though—when the midwife did the doppler and ultrasound this week, she was way low–like below the waist band of my pants. The belly bump at this phase must be from upward-misplaced guts or eating too many carbs so as not to barf! I can’t help analyzing all this stuff—it just interests me. I gained 1 or 2 pounds this week. If this is officially the end of my first trimester (who knows… people say different things, week 12, 13, 0r 14), then I gained 8 pounds total. It’s a weird feeling for me, and I won’t lie, it feels really uncomfortable. I am going with the flow and not worrying about it, but rather, I am focusing on my habits and I am very excited to be feeling better so that once I have more energy I will be able to be more active too. 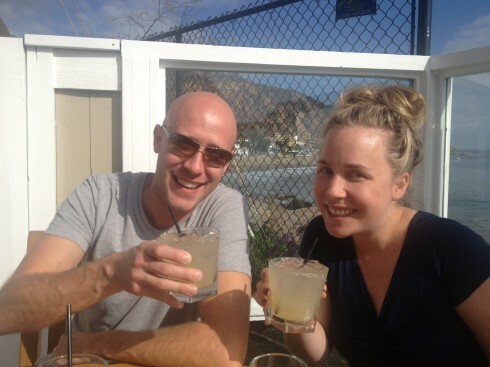 On Sunday, Dave and I picked up Kristen in Santa Monica and drove to Malibu for brunch… we stayed for 3 hours. They had lots of cocktails and I ate fries. Ha. It was so much fun we decided to go back this coming Sunday and invite more people. I love these guys. We had a fabulous seat next to the ocean—the pic happens to have the least picturesque angle (based on where the sun was). There was even a sea lion doing tricks for us! Any tips for getting my energy back? I definitely feel like I’m on the road to feeling great again, but the tiredness is still slowing me down. We’re in a bit of a crunch looking for a place to move to in the next couple weeks—long story, but I’ll fill you in once it happens. It’s urgent, but not an emergency… off I go to apartment hunt in LA (should be great for the stress level). OH! By the way, Michelle Ramirez won the $400 Amazon gift card giveaway! She has been notified. Stay tuned for another great giveaway in December! Oh the lack of energy…it it more frustrating than the other stuff. It should get better, but I don’t know that there is anything you can do to help it. I’m glad you’re feeling better and that things are moving in the right direction. Good luck apartment hunting! I agree with Sarena… hormones are totally overriding anything you could do for your energy levels. Just roll with it, the second trimester is the “honeymoon” trimester after all, you’re just about there! The food thing is so tough, the weight gain too. It will ALL come off and while you won’t ever be exactly the same again, you will be happy with your post-baby physique, with a new found respect for your body and what it can do! And isn’t it crazy the way your tastes change? I’m so curious about it and the reasons behind it… it’s got to be hormones, but why? To protect the growing fetus from the miniscule amounts of natural toxins in plants? I’ve always thought about this when introducing vegetables to them and why they often turn their noses up at some of the more bitter tasting vegetables. OK, this concludes my epic comment. It’s fun to read your updates! Good luck apartment hunting!